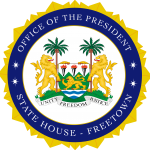 State House, Freetown, Thursday 9 August 2018 – Newly approved Chairman of the Public Service Commission, Kalilu Umar Bah, and two other commissioners, Muhamed Rakkalonko Koroma and Alhaji Banie Eillah Seisay, have today subscribed to the oath of office in accordance with Section 151(8) of the Constitution of Sierra Leone. Shortly after subscribing to the oath the new Chairman, who spoke on behalf of the other commissioners, thanked President Bio for the show of trust and confidence in them. He said that Sierra Leone had one of the best public service decades ago but unfortunately that was not the case at the moment. In line with the new direction, Bah pledged to work with his team to restore the commission to its past glory. The Public Service Commission was established in 1948 by the Constitution of Sierra Leone with the mandates to appoint persons to hold or act in offices in the Public Service, including the power to make appointments, promotions and to exercise disciplinary control over persons holding or acting in such offices.